We know for sure that Daniel Dill was in Mobile, Alabama by 1839. Between census records and his probate file, it’s clear that he had established a business, bought a home, owned slaves, and cultivated a network of friends and associates. On September 8, 1839, Daniel Dill and his slave Sam boarded the steamship Champion at the port of Mobile. They were on their way to Pensacola, Florida. I love that you can find out anything on the internet. I found out that the Champion was built in 1834 by Cornelius Vanderbilt – this was pretty early in the career of “Commodore Vanderbilt” and this ship may well have been among the first that he built. It was purchased by three men, one of whom, J. MacC. Baker, acted as the ship’s master. 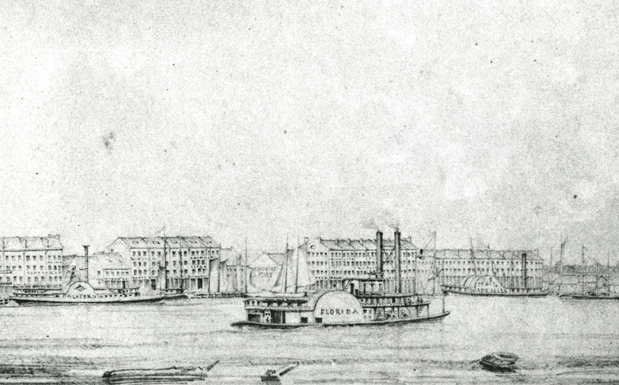 The Champion’s home port was Pensacola. It was probably a sidewheeler steamboat, just like you would imagine in the Old South. After the United States prohibited the slave trade (though not slavery itself) in 1808, any slave that was transported on a ship had to be listed in the manifest along with a signed statement by both the captain and the slave’s owner that the slave was not being imported into the country. Here are copies of both the manifest and the affidavit; note that the affidavit contains the signature of Daniel Dill himself and the ship’s master, J. MacC. Baker1. Isn’t it amazing that we can find such records? I wish I knew why Daniel and Sam were traveling from Mobile to Pensacola. Why did Daniel need his slave to travel with him? It’s also interesting that there is no record of a return trip. Of course it’s possible that the record is simply missing, but perhaps it could have been a one-way trip by steamship and a return by stagecoach or rail – or perhaps they went to pick up a carriage or something like that? Who knows. According to the manifest, Sam is 25 years old, 5 feet 10 inches tall. At this point, I have to say a few words about Daniel Dill’s ownership of slaves. It’s been very difficult for me to read about his slaves as detailed in the probate file. I have decided that I will write as much as I can about Sam, John and Nancy – real people who did not even have the dignity of a last name. I hope to do so respectfully and without further exploitation. 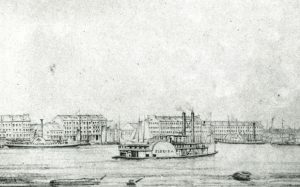 Pensacola Bay in 1861. Click to enlarge. 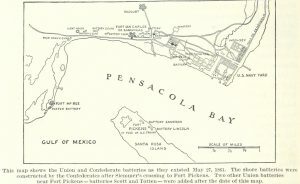 As the Champion made its way into Pensacola Bay, Daniel and Sam would have passed by Fort Pickens, Fort McRee and Fort Barrancas. These were major military construction projects built by the United States Army Corps of Engineers. 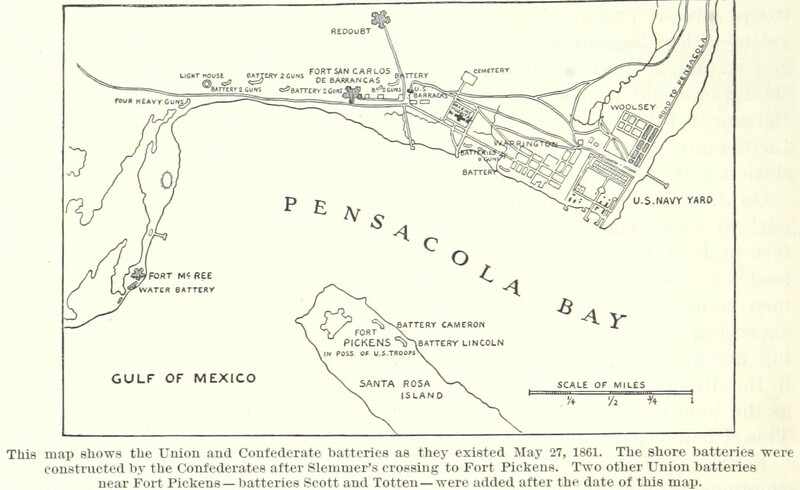 Fort McRee was brand-new and hadn’t even been named yet; Fort Pickens was just five years old. Pensacola resident Jasper Strong, a former West Point graduate, was a lead civilian contractor on these projects. His labor force consisted of over one hundred slaves. We will hear more about Jasper Strong in a later post. As an interesting side note, Fort Barrancas is today on the premises of the Pensacola Naval Air Station. I was born in the hospital there. 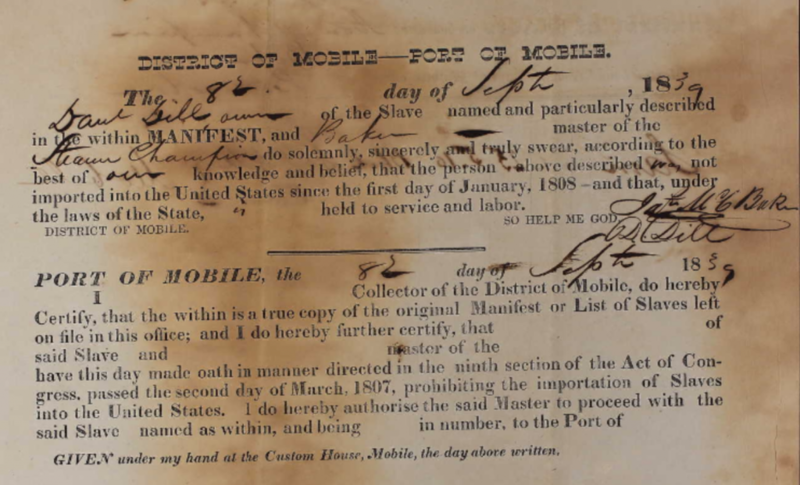 1National Archives and Records Administration – Southeast Region (Atlanta) (NRCAA), Morrow, GA; Coastwise Slave Manifests, 1801 – 1860; Record Group: 36, Records of the U.S. Customs Service; ARC Identifier: 1151775. Record obtained from ancestry.com. More good “stuff”! Love it!